The rows have been renumbered A to K, instead of B to L. We removed the original Row A many years ago and it was confusing to have the first row labeled B. So we’ve fixed that. Row A is still made up of removable chairs so as to be wheelchair accessible. We remove two chairs for every wheelchair/scooter. For this reason we don’t sell Row A online but ask you to purchase at Intwined Fibre Arts (recommended) or at the door. The two seats closest to each aisle in Rows B and C are good for people with walkers if they can handle one or two steps. The back row, K, how has an extra two inches of leg room for our long legged patrons. All seats are now a uniform 22 inches wide (previously anywhere between 18 1/2 and 22). The staggering of rows is now uniform for better sight lines. For those on your gift list who don’t need more stuff, why not give them an experience instead? Give the gift of live theatre with a Shuswap Theatre Gift Card. 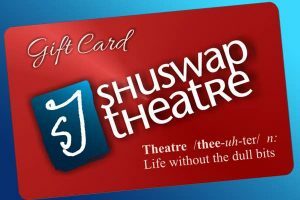 You pick the amount and it can be used as partial or full payment for any Shuswap Theatre event which offers online ticket sales (most of them). The gift cards have no expiry date and may be redeemed either online, at our ticket agent or at the door. Any unused portion is automatically carried forward for another event. Physical Gift cards are available only at Intwined Fibre Arts. Print-at-Home gift cards are available online (click the button above). Our most convenient option. Click the button below and use your credit card to reserve your choice of seats for any of our shows. There is a modest convenience fee for online purchases (less than last year). This fee is charged by Vendini, the company providing the service and does not go to Shuswap Theatre. You can avoid the fees by purchasing from our ticket agent, Intwined Fibre Arts (see below). We believe that cost should not be a barrier to enjoying live theatre. Therefore, we offer “Pay What You Can” Thursdays so that everyone can afford to see our plays. No reserved seats on these days and tickets are cash only at the door. NB: If you currently receive email news (The Prompter) from Shuswap Theatre (and want to continue) you must check “Stay informed by email” or else you will be unsubscribed. For an explanation read this notice. Note: If Buy Tickets Now button does not show on your browser click here. Save money and guarantee yourself the seat of your choice (yes, a new comfy bottom seat) by purchasing a season subscription. Subscriptions may be purchased on line or at Intwined Fibre Arts. Choose your performance dates and seats at the time of purchase. If your life circumstances require a change of dates for one of the shows, you may exchange those seats at Intwined Fibre Arts for another performance of the same play. ShuG o is a ticket-subsidy program to encourage youth aged 12 to 21 to attend live arts and cultural events in the Shuswap, and to help live-arts groups build their young audience. The Arts Council sells ShuGo tickets for $5 to youth aged 12 to 21. The youth themselves must purchase their own tickets at the Salmon Arm Arts Centre (the Art Gallery). Up to four tickets can be purchased at a time by one individual. A maximum of six tickets per year can be sold to one youth. The purchaser must then cross the street to Intwined Fibre Arts to exchange their ShuGo ticket for a reserved seat. ShuGo tickets (i.e. those not already traded for a “real” ticket) presented at the door will be admitted only if there are unsold tickets remaining for that performance.